Summer Fishing Tournament Contest - June 18 Only! Re: Summer Fishing Tournament Contest - June 18 Only! Do we need to have all of these Basking in the Sun fish On one specific character or are we able to have the fish that we catch on different characters? Cool and i am wondering is it rare. of course! Gg! Hoping for fish today! Any good recommendations to find these fish? Yay! Cannot wait to get there. @frostynico i would like to meet up to go fishing. I caught my fish in the Commons in WC. The fish is fire and it is kind of small looking. Hope this helps! It doesn't matter which character you use to catch the fish, the prizes are awarded per account. what school where is it at? I'm guessing the shark is a fire element . but I'm hoping there easy to catch. For everyone who has been asking, the fish is fire. What school is the fish? where are the fish located??? Hoping to catch one. Wish me luck! Will the ones I caught earlier before this even started still be counted? You don't have to do anything but catch the fish and you'll be automatically entered into the drawing. Hello. I was pondering about the drawing. Once you enter the drawing, do you need to catch the most fish to get the grand prize? Or if not is it just random? ‘Ello there, Wizards! Lucky Hookline here with a fun event happening right here in Wizard101! 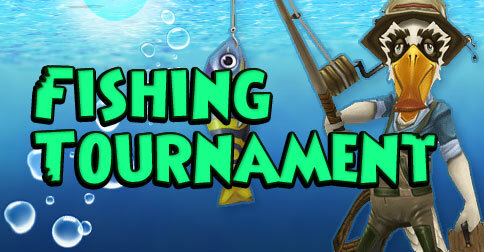 We’re havin’ ourselves a Summer fishin’ tournament and everyone’s invited! Here’s what ya need ta’ do. On June 18, 2015 (National Go Fishing Day) from 9:00 am to 11:59 pm US Central, Log on to Wizard101 and try to catch our new “Basking in the Sun” Shark. Every “Basking in the Sun” Shark you catch will act as an entry into a big giveaway for Crowns Prizes! One random winner will take home 60,000 Crowns and we’ll be giving away 10 more prizes of 10,000 Crowns. Get your box and tackle ready, you’ll only be able ta’ catch the new fish startin’ at 9:00am US Central on June 18. We’ll be tracking all the Summer Fish received by our players on June 18, 2015. We’ll total up the numbers here at KingsIsle, and enter players into a random drawing. On June 19, 2015, we’ll give out the awards and announce our winners on the KingsIsle Blog. Prizes will be applied directly to the winners' accounts on June 19, 2015. Only Summer Fish that are successfully acquired by players from 9:00 am to 11:59pm US Central on June 18, 2015 will count as entries. This contest is open to all (not just members) – just catch the Summer Fish on June 18, 2015 to enter. You may sell your fish after you acquire them. Fish are counted per account. Please email community@wizard101.com if you have additional questions. I caught it. It a fire fish . It kinda hard to catch though. So far i have four of them. I hope to win the crowns. I can't wait until tomorrow when they say the winners! Ice will pounce the other MINOR schools! ICE RULES! !